With seven different daily tracking polls to work with -- one of which releases three separate versions of its model each day -- there is a lot to choose from for those who might seek to cherry-pick results. 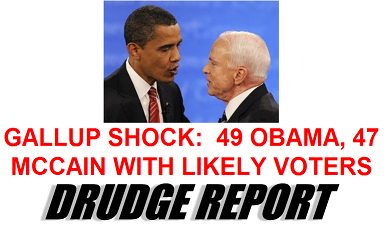 Let me be clear: I don't blame Drudge for trying to drive the narrative. Unlike certain other folks, it's not as though he's made any claim to being objective. With real news -- which polls aren't -- he generally has excellent and entertaining instincts. I do, however, blame those of who allow yourselves to have your day ruined when Drudge moonlights as some kind of polling analyst. A fairer way to analyze tracking polls, in any event, is something like this: McCain gained ground in three of the seven trackers today (Gallup, Rasmussen, Battleground). He lost ground in one (Zogby). Three others (Research 2000, Hotline, IBD/TIPP) were unchanged. That could indicate a slight tightening toward McCain, who also had gained ground on average in the tracking polls yesterday. It could also indicate statistical noise. What it probably does not indicate is any dramatic shift in the momentum of the race. Our model, indeed -- crunching all of this data along with the state polling -- does think Obama's momentum had stalled out about a bit, and pegs his national lead at closer to 7 points rather than the 8-point advantage it had given him a couple of days ago. Why? I don't know. Conventions are not the only events that produce bounces. Debates can too; if a candidate picks up, say, 3 points as the result of winning a debate, he might keep 2 of those points but give one of them back after a handful of days. To the extent that Obama has lost any steam, I sense that it is more something like that than anything constructive the McCain campaign has done. And of course, there was another debate last night, which most observers concluded that Obama won, and which may give him another momentum boost. That debate will begin to be reflected in tomorrow's numbers and will be fully rolled in by Sunday or Monday. Anything interesting here? Not really; even the notoriously erratic Zogby Interactive polls seem fairly well behaved. 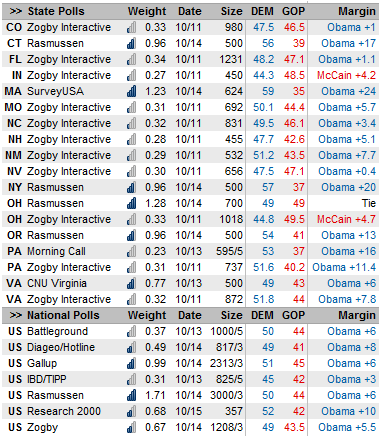 Rasmussen has Ohio moving back into a tie after Obama had led by 2 there earlier in the week. On the other hand, that 2-point lead represented the first time that Obama had led any Rasmussen poll of Ohio, so relative to their envisioning of the state, this remains a decent result for him.